She weighted 1500 tons. She had been sunked near Erdek harbour in 19th of August 1915 by E2 submarine. She weighted 1280 tons. She had been sunked in front of Bergos in 2nd of june 1915 by E11 Submarine. She weighted 450 tons. 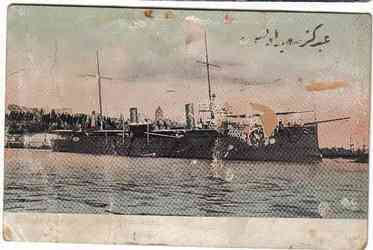 She had been sunked in Marmara sea in 1st of May 1915 by E-14 Submarine. She weighted 1500 tons. She had been sunked in front of Akbas in 5th og August 1915 by E-11 Submarine. She had been completed in 1890. She weighted 900 tons. Under the command of Nasmith, E-11 submarine had come near Bakirkoy, Istanbul in 23rd of May 1915 and sunked Peleng-i Derya gunboat there. She weighted 1500 tons. She had been sunked by E11 submarine in Sarkoy in 23rd August 1915.